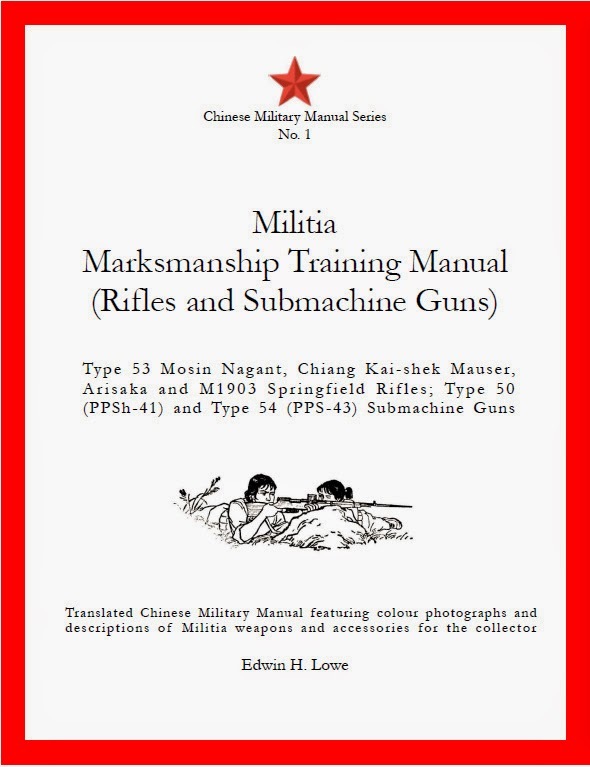 Edwin H. Lowe Publishing: New Publication: Militia Marksmanship Training Manual (Rifle and Submachine Guns) - Type 53 Mosin Nagant, Chiang Kai-shek Mauser, Arisaka and M1903 Springfield Rifles; Type 50 (PPSh-41) and Type 54 (PPS-43) Submachine Guns. New Publication: Militia Marksmanship Training Manual (Rifle and Submachine Guns) - Type 53 Mosin Nagant, Chiang Kai-shek Mauser, Arisaka and M1903 Springfield Rifles; Type 50 (PPSh-41) and Type 54 (PPS-43) Submachine Guns. Militia Marksmanship Training Manual (Rifle and Submachine Guns) - Type 53 Mosin Nagant, Chiang Kai-shek Mauser, Arisaka and M1903 Springfield Rifles; Type 50 (PPSh-41) and Type 54 (PPS-43) Submachine Guns. Translated and New Text by Edwin H. Lowe (Edwin H. Lowe Publishing 2015). This book is an illustrated training manual first published in 1973 for the training of the Chinese Militia in World War II era weapons. These are the Type 53 Mosin Nagant, Zhongzheng (Chiang Kai-shek) Mauser, Type 38 Arisaka, Type 99 Arisaka and M1903 Springfield rifles; the Type 50 (PPSh-41) and Type 54 (PPS-43) submachine guns. The manual is presented as a complete and original translation. Collectors and shooters of the rifles and submachine guns described in this book will find the manual useful. It contains the official Chinese military training instructions for the maintenance, marksmanship and field employment of these weapons, as well as data for the various weapons and ammunition types. Of particular interest to collectors, this book features colour photographs, descriptions and translations of markings of representative Chinese Militia weapons, accessories, ammunition labels, field equipment and accoutrements described in the manual. The Chinese Military Manual Series are translations of historical Chinese military manuals issued for the training of the People’s Liberation Army and the Militia. First published in the People’s Republic of China, these are the first publically available translations of Chinese military manuals in English. "This book is the beginning of more than just new revelations into Chinese military preparation, arms production and use. 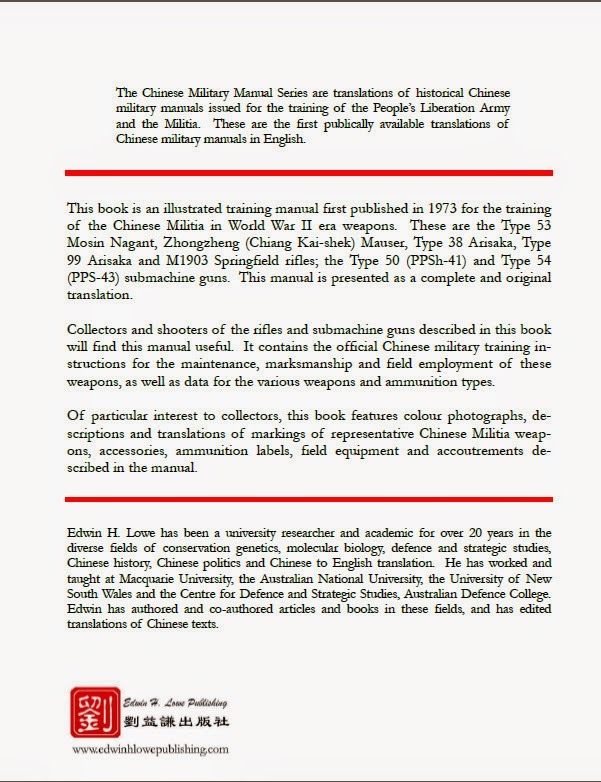 In addition to translating The Official Chinese Militia Marksmanship Training Manual (fascinating) Edwin Lowe includes information of interest to students of Chinese modern military preparation and history. New information pops up on every page. The color photos illuminate his concise and clearly written commentaries. The descriptions of the militia organization, gun accessories, ammunition identification and Militia badges foreshadows additional information forthcoming in his soon to be published book, 'Everyone a Solider! The Chinese Militia 1958-1984'. Everyone wondering where the new China came from will be rewarded with original information and insights into this formative period of Modern Chinese history. This book is the first step that Edwin Lowe is providing in an area ignored for far too long." "...it is outstanding and recommend it highly if you have any interest in the Weapons of the PLA... it is a great work and will fill a space in my library." "A well written translation, easy to read with sufficient explanations & citations to understand the content. Manual covers various weapons, tactics & accessories. There is also some interesting background information concerning not only the weapons involved but also the tactical/ political/ social/ technological issues & influences of the period. This manual sits comfortably alongside the Mosin Nagant Manuals (both J F Gebhardt & T W Lapin) & The Partisan's Companion (L Grau, M Gress). Recommended reading."